“Beyond shopping, many people went to visit friends, to have fun in Colombia,” Vielma Mora reportedly said of the exodus on Sunday, when the government of President Nicolás Maduro lifted a border closure in place since August 2015 for 12 hours. The governor made the declarations on his radio program, “Vielma Mora Constructs,” where he also denied that Venezuela has a hunger problem and compared Colombia to Syria. Of Colombia, Vielma Mora claimed, “it is the number one country with most citizens living abroad, more than Syria during a war, and the number one cocaine producer in the world according to the United Nations.” He denied that the Colombian-Venezuela border would ever be opened in a similar fashion again and denied the possibility of creating a “humanitarian corridor” for people in desperate need of food or medication to travel to Colombia and buy it. The 12-hour border opening Sunday — which connected the cities of San Cristóbal, Venezuela, and Cúcuta, Colombia — legally for the first time this year, followed a peaceful march the week before by an estimated 700 women, most wearing white, the color of anti-socialist resistance in Venezuela. 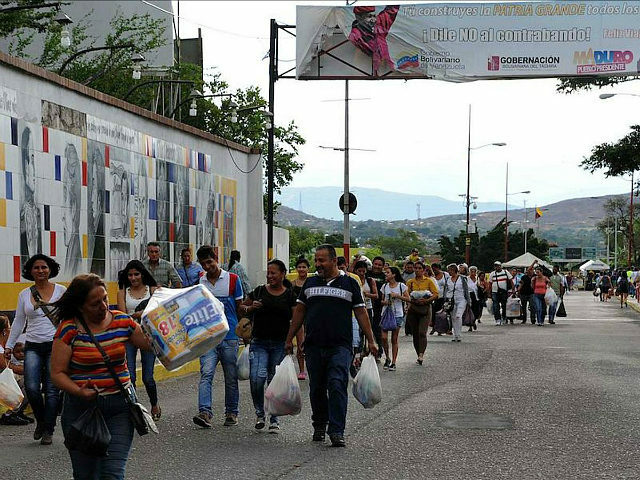 The women demanded to be let into Cúcuta to buy food, arguing that their families are starving as the supermarkets in Venezuela have run out of basic goods like flour, oil, and milk. The passage into Colombia and back occurred peacefully, but authorities appeared fearful that it would be the beginning of a series of such marches that could result in the reopening of the border. Maduro closed the border in August 2015, alleging that Colombians were forming “paramilitary gangs” to sell goods on the black market in Venezuela. Reporters embedded in the countryside have found evidence that it is the Venezuelan military, not Colombian civilians, working with smugglers. According to an NPR report, over one hundred trucks full of contraband enter Venezuela on a daily basis, unlabeled and accompanied by National Guard troops. Colombian stores on the border recorded a 190 percent increase in sales compared to regular Sunday business. The Colombian government has opposed the border closure since last year, and President Juan Manuel Santos has tasked his foreign minister, María Ángela Holguín, to negotiate with the Venezuelan government a way to reopen the border. Holguín has scheduled a meeting with her Venezuelan counterpart, Delcy Rodríguez, for August 4 in Venezuela to discuss the border issue.